Dried apple is a delicious, nutritious and healthy product. For 1kg of dried apple with 18-20% moisture as much as 8kg of fresh fruit is required. One of the main benefits of dehydrated apples is their dietary fiber content which is 8.7 grams per 100g. Dried apple contain several B vitamins, which collectively support one’s metabolism. Dehydrated apples are heath giving due to their mineral content. 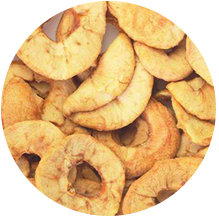 Dried apple is widely used by the confectionery, baking, and health food industries.